Mendham Township is a township in Morris County, in the central portion of northern New Jersey, United States, located more than 30 miles (48 km) due west of New York City. As of the 2010 United States Census, the township's population was 5,869, reflecting an increase of 469 (+8.7%) from the 5,400 counted in the 2000 Census, which had in turn increased by 863 (+19.0%) from the 4,537 counted in the 1990 Census. The township was originally formed on March 29, 1749, from portions of Hanover Township, Morris Township and Roxbury Township. After the Revolutionary War, on February 21, 1798, the township was incorporated by the Township Act of 1798 of the New Jersey Legislature as one of the state's initial group of 104 townships. Portions of the township were taken to create Randolph Township on January 1, 1806. Mendham Borough became an independent municipality when it was formed on May 15, 1906. The township may be named for Mendham, Suffolk, England, or the name may derive from the Native American word mendom (meaning "raspberry") or for an Earl of Mendham. According to the United States Census Bureau, the township had a total area of 18.100 square miles (46.881 km2), including 17.871 square miles (46.287 km2) of land and 0.229 square miles (0.594 km2) of water (1.27%). Unincorporated communities, localities and place names located partially or completely within the township include Brookside, Colemans Hollow, Days Mills, Pleasant Valley, Ralston and Washington Corner. The township surrounds Mendham Borough on three sides and borders Morris Township to the east, Harding Township to the southeast, Randolph to the north and Chester Township to the west all of which are located in Morris County. 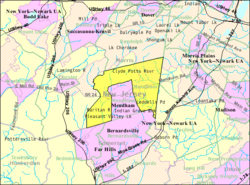 Bernardsville lies to the south and Peapack-Gladstone lies to the southwest, both located in Somerset County. As of the 2010 United States Census, there were 5,869 people, 1,952 households, and 1,659.200 families residing in the township. The population density was 328.4 per square mile (126.8/km2). There were 2,062 housing units at an average density of 115.4 per square mile (44.6/km2). The racial makeup of the township was 93.32% (5,477) White, 1.29% (76) Black or African American, 0.05% (3) Native American, 3.41% (200) Asian, 0.00% (0) Pacific Islander, 0.56% (33) from other races, and 1.36% (80) from two or more races. Hispanic or Latino of any race were 3.60% (211) of the population. There were 1,952 households out of which 44.6% had children under the age of 18 living with them, 78.0% were married couples living together, 5.1% had a female householder with no husband present, and 15.0% were non-families. 12.7% of all households were made up of individuals, and 6.3% had someone living alone who was 65 years of age or older. The average household size was 2.99 and the average family size was 3.28. In the township, the population was spread out with 30.2% under the age of 18, 5.1% from 18 to 24, 15.4% from 25 to 44, 36.7% from 45 to 64, and 12.5% who were 65 years of age or older. The median age was 44.6 years. For every 100 females there were 97.5 males. For every 100 females ages 18 and older there were 94.7 males. The Census Bureau's 2006-2010 American Community Survey showed that (in 2010 inflation-adjusted dollars) median household income was $162,125 (with a margin of error of +/- $44,498) and the median family income was $194,028 (+/- $20,875). Males had a median income of $163,594 (+/- $46,204) versus $76,136 (+/- $53,301) for females. The per capita income for the borough was $93,011 (+/- $10,203). About 0.6% of families and 1.7% of the population were below the poverty line, including 1.2% of those under age 18 and 0.0% of those age 65 or over. As of the 2000 United States Census there were 5,400 people, 1,788 households, and 1,539 families residing in the township. The population density was 302.4 people per square mile (116.7/km²). There were 1,849 housing units at an average density of 103.5 per square mile (40.0/km²). The racial makeup of the township was 95.91% White, 0.93% African American, 0.09% Native American, 2.02% Asian, 0.35% from other races, and 0.70% from two or more races. Hispanic or Latino of any race were 1.52% of the population. In the township the population was spread out with 32.0% under the age of 18, 3.6% from 18 to 24, 23.8% from 25 to 44, 29.9% from 45 to 64, and 10.8% who were 65 years of age or older. The median age was 40 years. For every 100 females, there were 96.8 males. For every 100 females age 18 and over, there were 94.1 males. Mendham Township was ranked in 2000 as the 17th wealthiest community in the state of New Jersey, after having been ranked tenth a decade earlier. Per capita income increased by 30.4% from the previous census, with income growth ranked 473rd among the state's 566 municipalities. Mendham Township operates under the township form of New Jersey municipal government. The five-member Township Committee is elected directly by the voters at-large in partisan elections to serve three-year terms of office on a staggered basis, with either one or two seats coming up for election each year as part of the November general election in a three-year cycle. At an annual reorganization meeting held on the first Monday after January 1, the newly reconstituted township committee selects one of its members to serve as mayor, and another to serve as deputy mayor. In February 2018, Deputy Mayor Rick Blood resigned from office in the wake of an outcry ensuing from a Facebook post by Blood which likened President Donald Trump and his efforts regarding undocumented immigrants to an exterminator getting rid of "hundreds of rabid, messy, mean raccoons" that had overrun a basement in a home. Blood had run for office in November 2017 as the Republican candidate for Township Committee and lost to Amalia Duarte, the first Democratic candidate to have won a seat in Township history, as it has been a long-time Republican stronghold. After the loss in the November election, Blood had then been appointed in December 2017 to fill the seat expiring in December 2018 that had been vacated by Chris Baumann due to business obligations and was elected as Deputy Mayor at the January 2018 reorganization meeting. Former township committeeman Brian Phelan was inducted into the New Jersey State Elected Officials Hall of Fame in 2011. Mendham Township is located in the 11th Congressional District and is part of New Jersey's 25th state legislative district. As of November 8, 2016, there were a total of 4,995 registered voters in Mendham Township, of which 960 (19.2%) were registered as Democrats, 2,224 (44.5%) were registered as Republicans and 1,799 (36.1%) were registered as Unaffiliated. There were 3 voters registered to other parties. In the 2012 presidential election, Republican Mitt Romney received 64.5% of the vote (2,108 cast), ahead of Democrat Barack Obama with 34.6% (1,130 votes), and other candidates with 0.9% (28 votes), among the 3,279 ballots cast by the township's 4,691 registered voters (13 ballots were spoiled), for a turnout of 69.9%. In the 2008 presidential election, Republican John McCain received 58.1% of the vote (2,080 cast), ahead of Democrat Barack Obama with 40.8% (1,461 votes) and other candidates with 0.6% (21 votes), among the 3,581 ballots cast by the township's 4,608 registered voters, for a turnout of 77.7%. In the 2004 presidential election, Republican George W. Bush received 62.4% of the vote (2,203 ballots cast), outpolling Democrat John Kerry with 36.7% (1,296 votes) and other candidates with 0.4% (20 votes), among the 3,532 ballots cast by the township's 4,529 registered voters, for a turnout percentage of 78.0. In the 2013 gubernatorial election, Republican Chris Christie received 80.9% of the vote (1,795 cast), ahead of Democrat Barbara Buono with 18.0% (400 votes), and other candidates with 1.1% (25 votes), among the 2,242 ballots cast by the township's 4,624 registered voters (22 ballots were spoiled), for a turnout of 48.5%. In the 2009 gubernatorial election, Republican Chris Christie received 67.4% of the vote (1,914 ballots cast), ahead of Democrat Jon Corzine with 23.5% (666 votes), Independent Chris Daggett with 8.0% (227 votes) and other candidates with 0.1% (3 votes), among the 2,838 ballots cast by the township's 4,547 registered voters, yielding a 62.4% turnout. Public school students in pre-kindergarten through eighth grade attend the Mendham Township Public Schools. As of the 2014-15 school year, the district and its two schools had an enrollment of 1,121 students and 71.8 classroom teachers (on an FTE basis), for a student–teacher ratio of 15.6:1. Schools in the district (with 2014-15 enrollment data from the National Center for Education Statistics) are Mendham Township Elementary School with 332 students in grades PreK-4 and Mendham Township Middle School with 375 students in grades 5-8. Mendham Township Middle School was one of 11 in the state to be recognized in 2014 by the United States Department of Education's National Blue Ribbon Schools Program. Students in public school for ninth through twelfth grades attend West Morris Mendham High School, which is located in Mendham Borough and serves students from Chester Borough, Chester Township, Mendham Borough and Mendham Township. The school is part of the West Morris Regional High School District, which also serves students from Washington Township at West Morris Central High School. As of the 2014-15 school year, the high school had an enrollment of 1,386 students and 105.5 classroom teachers (on an FTE basis), for a student–teacher ratio of 13.1:1. As of May 2010[update], the township had a total of 70.70 miles (113.78 km) of roadways, of which 63.51 miles (102.21 km) were maintained by the municipality and 7.19 miles (11.57 km) by Morris County. No Interstate, U.S. or state highways pass directly through Mendham Township. The most significant roadway directly serving the township is County Route 510. For those heading to points outside the township, Interstate 287, Interstate 80, and Interstate 78, are all accessible nearby. NJ Transit offered service on the MCM4 and MCM5 routes until 2010, when subsidies to the local provider were eliminated as part of budget cuts. Commuters traveling via public transportation can drive to the Morristown station to access New Jersey Transit Midtown Direct express train line into Midtown Manhattan. See also: Category:People from Mendham Township, New Jersey. Chris Christie (born 1962), Past New Jersey Governor and former United States Attorney. Peter Dinklage (born 1969), Emmy and Golden Globe-winning actor who starred in The Station Agent, Threshold and Game of Thrones. Abner Doubleday (1819–1893), Civil War general and purported inventor of baseball. Morris Frank (1908-1980), co-founder of The Seeing Eye. Joey McCarthy (born 1972), retired NASCAR driver. Rick Merkt (born 1949) represented the 25th Legislative District in the New Jersey General Assembly from 1998 to 2010. Stewart G. Pollock (born 1933), Justice of the Supreme Court of New Jersey from 1979 to 1999. William "Green Bar Bill" Hillcourt (1900–1992), author and national official of the Boy Scouts of America, at nearby Schiff Scout Reservation from the 1930s to the 1970s. ^ a b Mendham Township Committee, Mendham Township. Accessed February 16, 2018. ^ Township Administrator, Mendham Township. Accessed February 16, 2018. ^ U.S. Geological Survey Geographic Names Information System: Township of Mendham, Geographic Names Information System. Accessed March 8, 2013. ^ a b c d e f DP-1 - Profile of General Population and Housing Characteristics: 2010 for Mendham township, Morris County, New Jersey, United States Census Bureau. Accessed December 18, 2012. ^ a b c Profile of General Demographic Characteristics: 2010 for Mendham township, New Jersey Department of Labor and Workforce Development. Accessed December 18, 2012. ^ Look Up a ZIP Code for Mendham, NJ, United States Postal Service. Accessed December 18, 2012. ^ Area Code Lookup - NPA NXX for Mendham, NJ, Area-Codes.com. Accessed September 24, 2013. ^ Historical Timeline of Morris County Boundaries, Morris County Library. Accessed December 24, 2016. "1749, March 29.Mendham Township is established from Hanover, Morris, and Roxbury Township." ^ a b Snyder, John P. The Story of New Jersey's Civil Boundaries: 1606-1968, Bureau of Geology and Topography; Trenton, New Jersey; 1969. p. 194. Accessed October 29, 2012. ^ Hutchinson, Viola L. The Origin of New Jersey Place Names, New Jersey Public Library Commission, May 1945. Accessed September 5, 2015. Spelled as "Myndham". ^ Gannett, Henry. The Origin of Certain Place Names in the United States, p. 205. United States Government Printing Office, 1905. Accessed September 5, 2015. Note error in the name of the county. ^ Kelley, Tina. "An Outpost of New England", The New York Times, February 2, 2014. Accessed September 5, 2015. "The origin of the town's name — preserved on the sign of the Black Horse as 'I'll Mend 'Em' — has been the subject of animated debate. Did it come from the Indian word 'mendom,' for raspberry or huckleberry? Was it chosen to honor the British Earl of Mendham?" ^ Beck, Henry Charlton. Tales and Towns of Northern New Jersey, pp. 128-149. Rutgers University Press, 1983. ISBN 9780813510194. Accessed September 5, 2015. ^ Locality Search, State of New Jersey. Accessed October 3, 2018. ^ Areas touching Mendham Township, MapIt. Accessed October 3, 2018. ^ Bowen, Francis. American Almanac and Repository of Useful Knowledge for the Year 1843, p. 231, David H. Williams, 1842. Accessed July 15, 2013. ^ Raum, John O. The History of New Jersey: From Its Earliest Settlement to the Present Time, Volume 1, p. 256, J. E. Potter and company, 1877. Accessed December 18, 2012. "Mendham contained a population in 1850 of 1,723; in 1860, 1,660; and in 1870, 1,573." ^ Debow, James Dunwoody Brownson. The Seventh Census of the United States: 1850, p. 140. R. Armstrong, 1853. Accessed December 18, 2012. ^ Staff. A compendium of the ninth census, 1870, p. 260. United States Census Bureau, 1872. Accessed December 18, 2012. ^ Porter, Robert Percival. Preliminary Results as Contained in the Eleventh Census Bulletins: Volume III - 51 to 75, p. 98. United States Census Bureau, 1890. Accessed December 18, 2012. ^ Fifteenth Census of the United States: 1930 - Population Volume I, United States Census Bureau, p. 717. Accessed December 18, 2012. ^ a b c d e Census 2000 Profiles of Demographic / Social / Economic / Housing Characteristics for Mendham township, Morris County, New Jersey, United States Census Bureau. Accessed December 18, 2012. ^ a b c d e DP-1: Profile of General Demographic Characteristics: 2000 - Census 2000 Summary File 1 (SF 1) 100-Percent Data for Mendham township, Morris County, New Jersey, United States Census Bureau. Accessed December 18, 2012. ^ DP03: Selected Economic Characteristics from the 2006-2010 American Community Survey 5-Year Estimates for Mendham township, Morris County, New Jersey, United States Census Bureau. Accessed December 18, 2012. ^ "Money Income (1989 and 1999) and Poverty (1999) New Jersey, counties, and Municipalities", Division of Labor Market and Demographic Research New Jersey State Data Center, April 2003. Accessed September 24, 2013. ^ 2017 Municipal User Friendly Budget, Mendham Township. Accessed February 16, 2018. ^ Morris County Manual 2017, Morris County, New Jersey Clerk. Accessed February 6, 2018. ^ Morris County Municipal Elected Officials For The Year 2017, Morris County, New Jersey Clerk, updated June 6, 2017. Accessed February 6, 2018. ^ General Election November 7, 2017 Official Results, Morris County, New Jersey Clerk. updated November 17, 2017. Accessed January 1, 2018. ^ November 3, 2015 Official General Election Winners, Morris County, New Jersey Clerk. Accessed February 6, 2018. ^ Jennings, Rob. "Watch: Deputy mayor resigns amid backlash over post comparing immigrants to raccoons", NJ Advance Media for NJ.com, February 13, 2018. Accessed February 16, 2018. "Mendham Township Deputy Mayor Rick Blood resigned late Monday night after igniting a firestorm with his Facebook post comparing undocumented immigrants to raccoons in a basement and lauding President Trump as the exterminator.... He was appointed to fill a vacancy in December, one month after losing a race for an open seat to Amalia Duarte, a Democrat, and elevated to the ceremonial post of deputy mayor in January." ^ a b Izzo, Michael. "Mendham Township Committee swears in first Democrat", Daily Record (Morristown), January 9, 2018. Accessed February 16, 2018. "With her family by her side, Amalia Duarte broke new ground when she was sworn in as the first Democrat on the Township Committee.... After Duarte was sworn in, she went right to work, supporting the nomination of Richard Diegnan as the mayor and nominating Warren Gisser for deputy mayor. Rick Blood, who Duarte beat in the November election, but was appointed to fill an unexpired term on the council in December won the deputy vote." ^ Township Committee Meeting Minutes December 4, 2017, Township of Mendham. Accessed February 16, 2018. "Mayor Orban Brown announced that on December 1st, Mr. Baumann resigned as a committeeman due to business obligations.... His three-year term expires December 31, 2018.... Mr, Cioppettini nominated Rick Blood, Mr. Diegnan seconded the nomination.... The Mayor asked for all in favor and all voted yes." ^ Elected Officials Hall of Fame: 2011 Inductee List, New Jersey State League of Municipalities. Accessed September 5, 2015. ^ District information for Mendham Township School District, National Center for Education Statistics. Accessed December 7, 2016. ^ School Data for the Mendham Township Public Schools, National Center for Education Statistics. Accessed December 12, 2016. ^ Mendham Township Elementary School, Mendham Township Public Schools. Accessed March 20, 2017. ^ Mendham Township Middle School, Mendham Township Public Schools. Accessed March 20, 2017. ^ New Jersey School Directory for the Mendham Township Public Schools, New Jersey Department of Education. Accessed December 29, 2016. ^ School Profile 2016-2017, West Morris Mendham High School. Accessed March 19, 2017. "West Morris Mendham High School, serving grades 9-12, is a college preparatory institution. Students reside in either Mendham or Chester, which are both semi-rural communities with a mix of upper-middle class to high-income families." ^ West Morris Regional High School District 2015 Report Card Narrative, New Jersey Department of Education. Accessed June 4, 2016. "Established in 1958, the West Morris Regional High School District operates two schools, West Morris Central High School and West Morris Mendham High School. The regional district serves the students of five Morris County communities: Chester Borough, Chester Township, Mendham Borough, Mendham Township and Washington Township. Students from Washington Township attend West Morris Central High School, and students from the Chesters and the Mendhams attend West Morris Mendham High School." ^ School data for West Morris Mendham High School, National Center for Education Statistics. Accessed December 12, 2016. ^ Private Carrier Bus Service reductions, NJ Transit. Accessed August 8, 2015. ^ Goldberg, Dan. "Gov. Chris Christie won't say how he voted on Mendham Township school budget", The Star-Ledger, April 20, 2010. Accessed February 15, 2011. ^ Minauti, Dave. "Movie with Morris ties gets 3 Actors Guild nominations: Filmed in county, 'The Station Agent' also stars Mendham Twp. native", Daily Record (Morristown), January 16, 2004. Accessed February 15, 2011. "The star of the film, Mendham Township native Peter Dinklage, was nominated for outstanding performance by a male actor in a leading role." ^ Staff. "Death Of Gen. Doubleday: His Services During Two Wars and Successive Promotions", The Baltimore Sun, January 28, 1893. Accessed February 15, 2011. "Gen. Abner Doubleday died last evening at his home in Mendham." ^ Staff. "Millennium Moments", Daily Record (Morristown), September 20, 1999. Accessed February 15, 2011. "Morris Frank pioneer for blind. Morris S Frank lost his sight by age 16 but he became a man of tremendous vision. A longtime resident of Mendham Township, Frank was a pioneer of the Seeing Eye guide dog movement in the United States." ^ Friedman, Roger. "Whitney Houston and Bobby Brown: 'Addicted to Each Other'", Fox News, September 14, 2006. Accessed August 14, 2007. "Houston owns an estate in Mendham, N.J., but it's likely that it's in her name only. Houston's family uses the Mendham home as their headquarters, and Brown is rarely seen there. Whitney bought the Mendham estate in 1987 for about $2.2 million, according to public records, with a $1.4 million mortgage." ^ Ragonese, Lawrence. "GOP Gov candidate Merkt finishes running tour of N.J. towns", The Star-Ledger, May 20, 2009. Accessed December 19, 2012. "Rick Merkt has ended his 'run' for governor. The 59-year-old Mendham Township Republican trotted 1.5 miles to the Morristown Green today at lunch hour, finishing a jogging tour that took him to all 566 municipalities in New Jersey in eight months." ^ Assembly Member Richard A. 'Rick' Merkt, Project Vote Smart. Accessed August 17, 2007. ^ Staff. "Gov. Chris Christie nominates lawyer Anne M. Patterson to N.J. Supreme Court", The Star-Ledger, May 3, 2010. Accessed May 11, 2017. "Patterson, 51, of Mendham Township, formerly served as a special assistant to the Attorney General and Deputy Attorney General of the State of New Jersey, according to her bio at Riker Danzig, a law firm where she is a partner." ^ Kocieniewski, David. "Judge Leaving High Court After 20 Years as Unifier", The New York Times, February 26, 1999. Accessed June 14, 2016. "Judge Pollock was born in East Orange and raised in Brookside, back when it had only 1,300 residents and a four-room schoolhouse. He still lives there, although the suburban boom of the last half-century has expanded Brookside and made it one of wealthiest communities in central New Jersey." ^ via Associated Press. "William Hillcourt, A Boy Scout Writer And Columnist, 92", The New York Times, November 14, 1992. Accessed October 3, 2018. "His body will be returned to the United States later this month and buried alongside his wife in Mendham, N.J., where the Hillcourts lived for many years." Wikimedia Commons has media related to Mendham Township, New Jersey.